The title of Brecht's play is really Mother Courage and Her Children, although people often forget the kids are there. That's how indelible a character Mother Courage is. Fierce, hard, practical and cynical... She's a woman who does what she needs to do, changes sides as often as she needs to, keeps pulling her cart, keeps selling trinkets to both sides in an endless war, and mostly just finds a way to survive. But her children -- Eilif, son of a thief, Swiss Cheese, whose father was a Swiss (of course) engineer, and mute Katrin, with a German dad -- don't survive. They're the price she pays for building her life around war. Mother Courage isn't her real name, of course. She's called that because she once drove her cart through the middle of a battle just to sell moldy bread. "I'm not courageous," she tells us in Tony Kushner's version of the script. "Only the poor have courage. Why? Because they're hopeless." Brecht wrote his play in 1939, with Hitler and fascism threatening all of Europe. The play isn't set in anything 20th century, however. Instead, Brecht went with the Thirty Years War, a particularly devastating and prolonged conflict that raged all over Europe in the 17th century. But Mother Courage has been done all over the world, against the backdrop of just about every war imaginable. Some productions, like the one with Meryl Streep and Kevin Kline at the Public Theatre in 2006, mix bits and pieces of uniforms and weapons from different parts of history, just to illustrate how little things change and how closely tied to human existence (and economics) war is tied. Sandi Zielinski directs Mother Courage and her Children in Westhoff Theatre for Illinois State University, opening tonight with a 7:30 pm performance, and running through October 27. Because Westhoff is not a large space, its shows tend to sell out, so you are advised to get your tickets early and arrive early, as well. This production is using Tony Kushner's script, which played to good effect in New York (as discussed above, with Meryl Streep) as well as in London with Fiona Shaw in the title role. For ISU, Abby Vombrack steps into Mother Courage's boots, with Tommy Malouf, Alex Kostner and Michelle Stine as her ill-fated children. Matt Campbell, MFA directing candidate who just finished up The Glory of Living, plays the Cook, another character out for the main chance, while Andrew Rogalny takes on the role of the cowardly, hypocritical Chaplain. Although there are songs in the show (expected with Mother Courage), this production is not using the score Jeanine Tesori wrote for Kushner's adaptation. Rumor has they're looking for more of a rock edge, with guitars on stage instead of the usual piano. 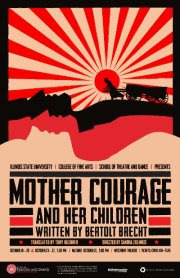 For more information on ISU's production, check out this Facebook page for Mother Courage and Her Children or ISU's productions page.